There seems to have been little research performed on effects of invertebrates on Basidiomycota physiology and metabolism, yet such effects are sometimes likely to be large, in view of the dramatic changes to morphology mentioned above. Grazing by F. candida altered the partitioning of 15N added to soil close to the wood inoculum (G.M. Tordoff et al., unpublished): less 15N was transferred to new mycelial growth in grazed systems than in ungrazed systems, presumably related to slower growth and altered mycelial morphology. 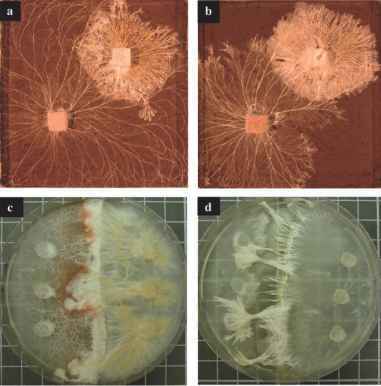 Changes in extracellular enzyme activity have been noted: P. velutina and Stereum hirsutum exhibited differential responses to the presence of the nematode Panagrellus redividus (Dyer et al., 1992). Protease activity increased while esterase and acid phosphotase activities were reduced in P. velutina. In contrast, there was increased protease and acid phosphotase activity in S. hirsutum. There is also some evidence of reduction in wood inoculum decay rate when extra-resource mycelia were grazed (Tordoff et al., 2006). On the other hand, a small field study showed an increase in wood decay rate following invertebrate invasion, though others did not (Swift and Boddy, 1984).